Release Train 6/27/18 | CommentSold Help Center! Tired of having items expire in the middle of the night? Disable this handy dandy new feature here so your carts don't expire between 11pm-7am. You get a gift card, you get a gift card! No really.... you do! Once enabled, create your gift card product from the products tab. You can also manually issue gift cards to any customer as well from your gift card tab! Request the amount you'd like to charge and the system will send them an email prompting them to log in and pay the requested shipping amount! 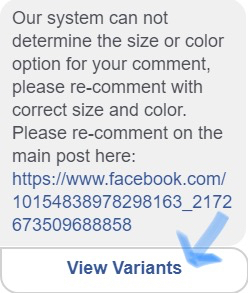 Regardless of posting as the page, or as a group admin, we can send your customer a messenger message regarding their invalid comment! They can then choose to view the correct variants, and add to cart! View each of your posts separately between Facebook, Instagram, App, and SMS! Adding a new variant? Put it in its place! If you haven't heard the news.... Android apps are OUT! Thanks to everyone with their patience on this, we hope your Android customers are loving their new apps! We are almost finished adding product media galleries on mobile. Soon your customers will be able to scroll any images or video associated with a product on its detail screen. Look out for this feature in an upcoming beta release! Begin registering through the Mobile App Set Up! Diversify and own your customers! Chat us if you want more information! Big Commerce integration! Sync your BC inventory with Commentsold! The integration is still beta, so please keep this in mind while we work through some of the bugs! You can use emojis in app posts! Instagram posts' "show comments" page has been updated to show you when items have been removed/expired from cart. Enable Canadian shipping here and set your Canadian shipping cost! Refund shipping cost ONLY by clicking the label icon next to any order! Allow a product to have $0 cost. You can check this box on the inventory screen from any product! Help us vote on new features!